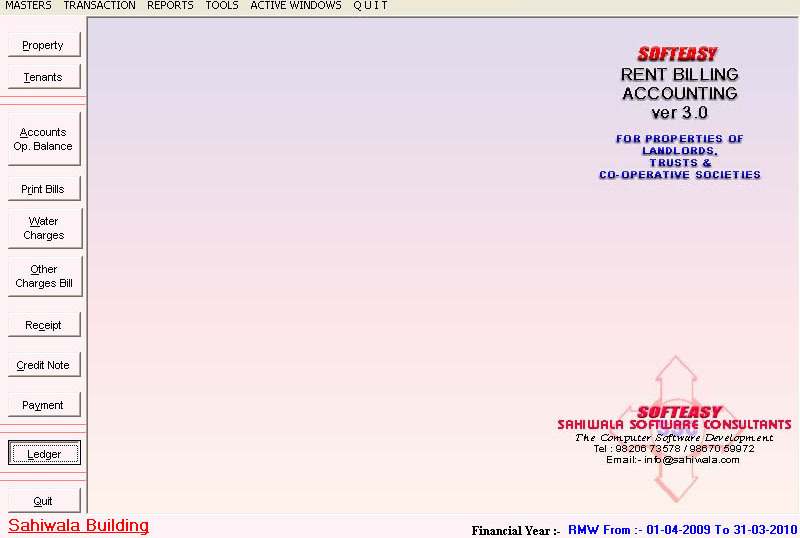 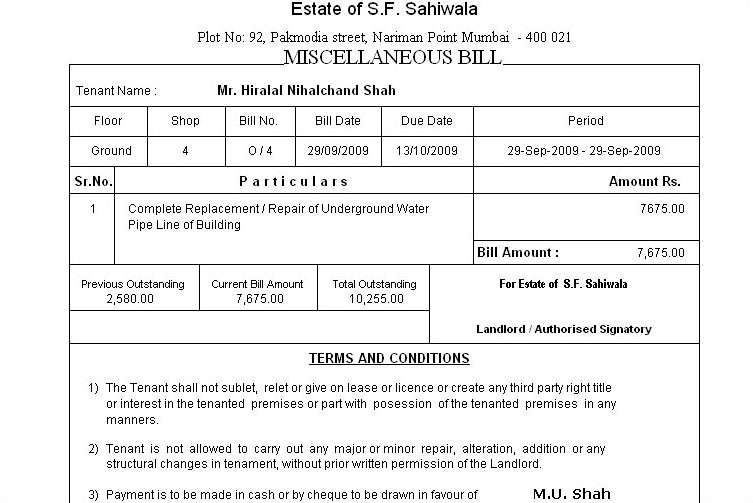 Sahiwala Software Consultants is the Indian Software Company locating in mumbai and the Rent Landlord Property Management Software is one of our Readymade software and ready to use software. 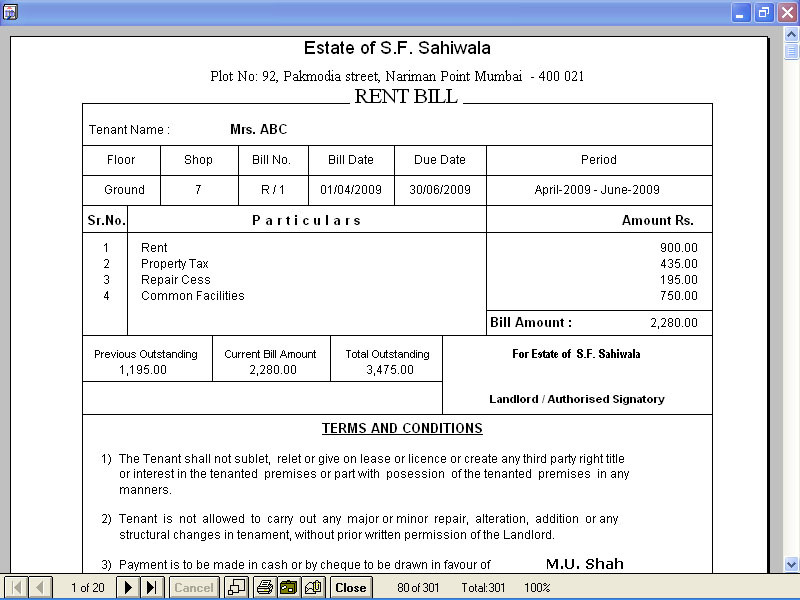 The Rental property management Software is for the maintanance and management of the buildings, property and its tenants. 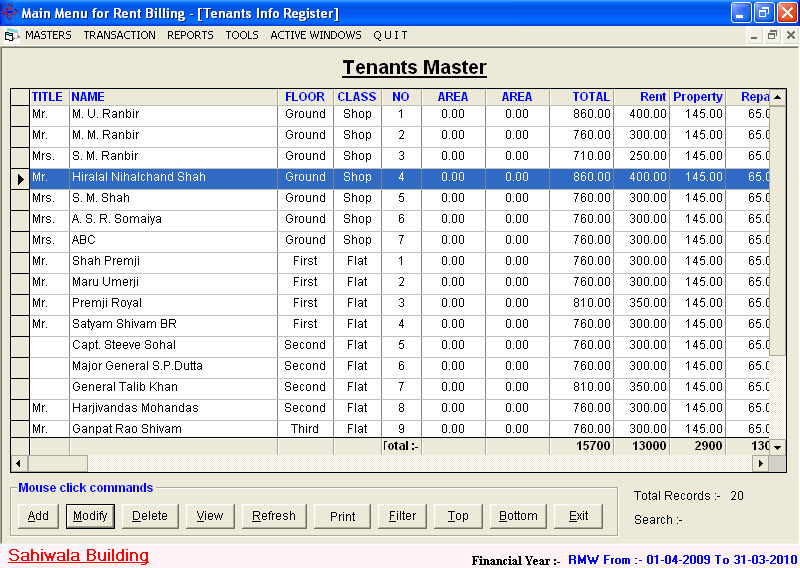 The Tenant Property Billing Management Software has the Property master where you can define your property from where the rent has to be collected.After defining the property in landlords property management software, here comes the tenants master where you have to feed the tenants name and the tenants allocation space in the property vis a vis its floor, area, class and number and the details and bifurcation of the rent i.e. 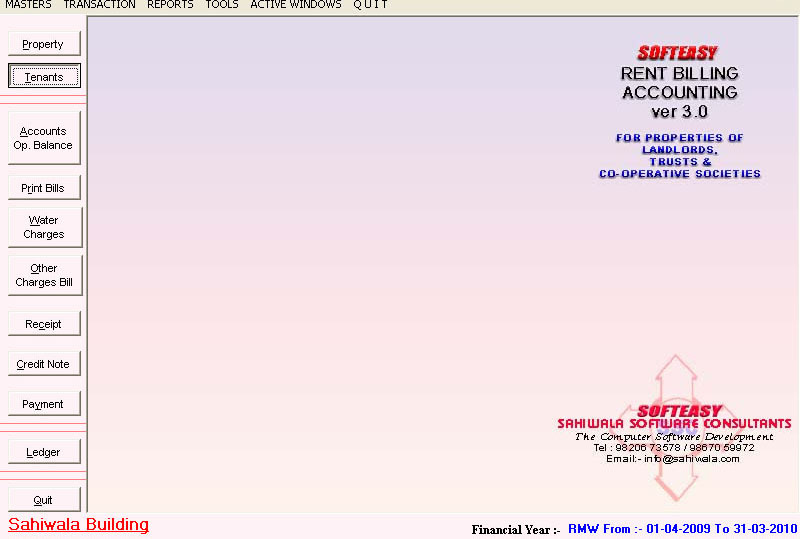 Basic rent, municipal taxes, GST, repairs and cess, common facilities, security salary etc. 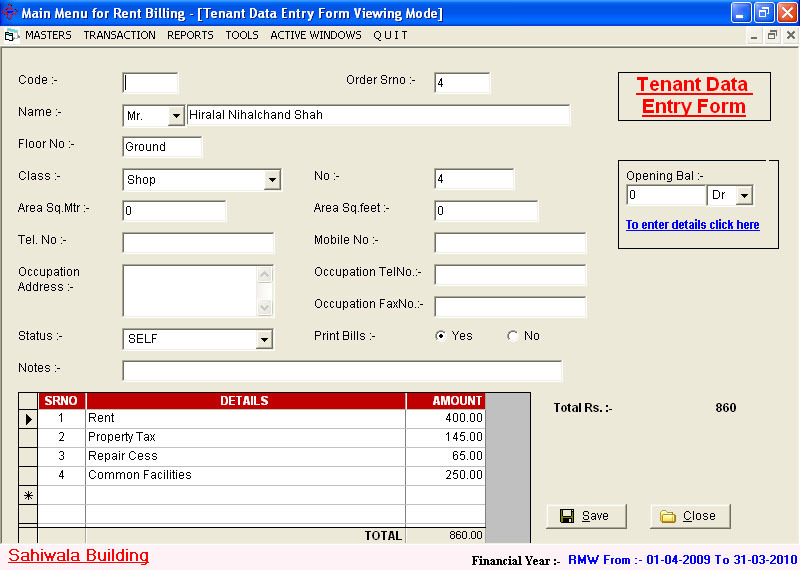 The rent tracker software(billing tenant rental software) is automatic in the sense after feeding the whole tenants details regarding its basic rent, reparis in the tenants master the software removes the print bills itself without entering the data entry of the bills of that particular tenants in that specific month. 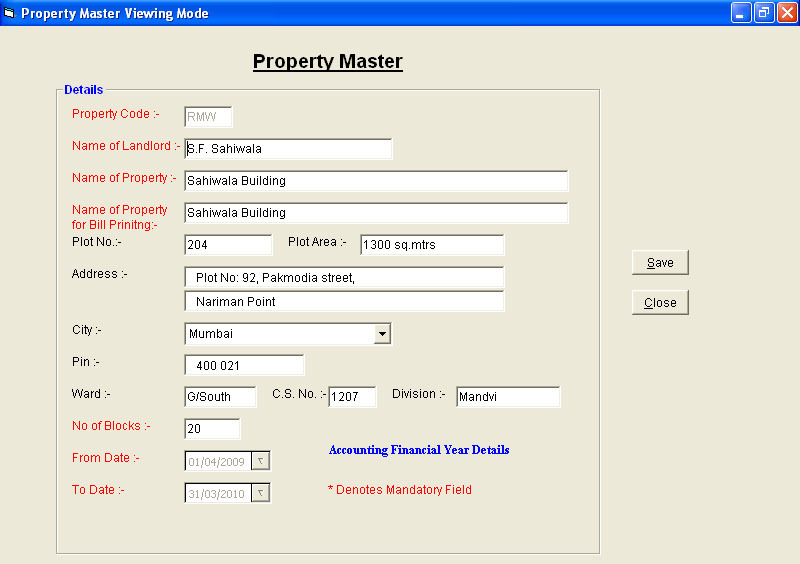 Property Master Data Entry Screen of Rent Billing Software. 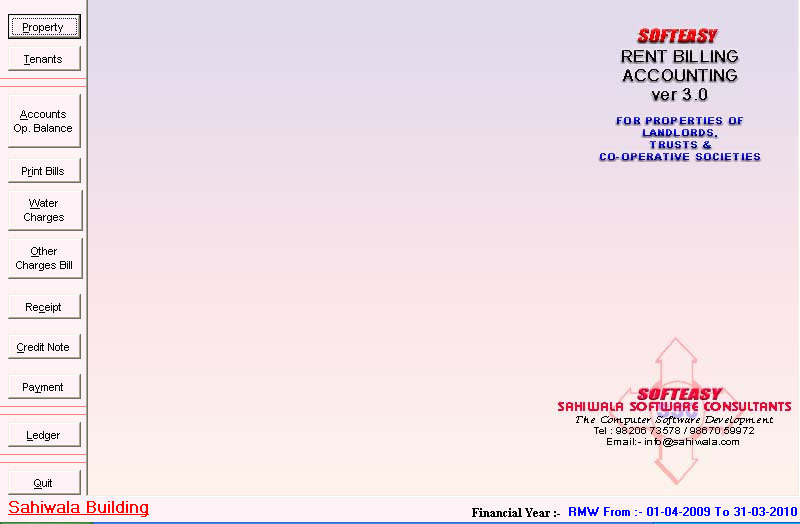 The Landlords Rent accounting software is the reaymade software and ready to use software and it can also be customized as per clients requirements. 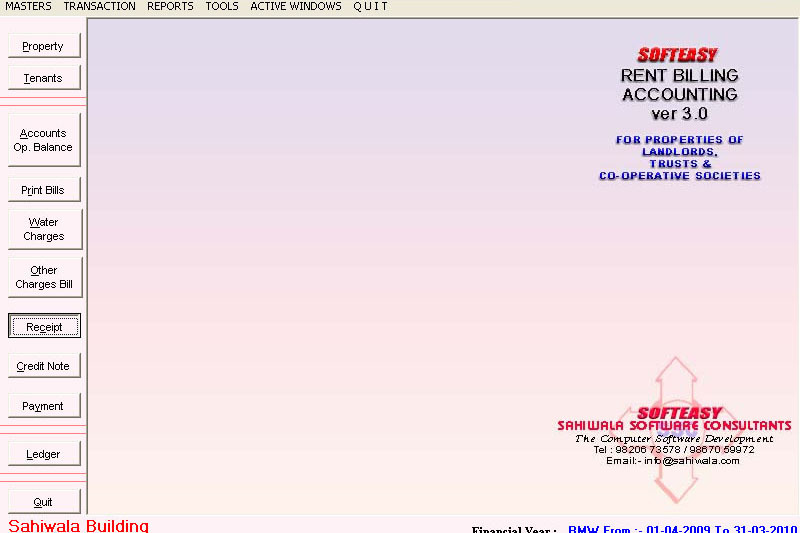 esp we are in to more of customization software. 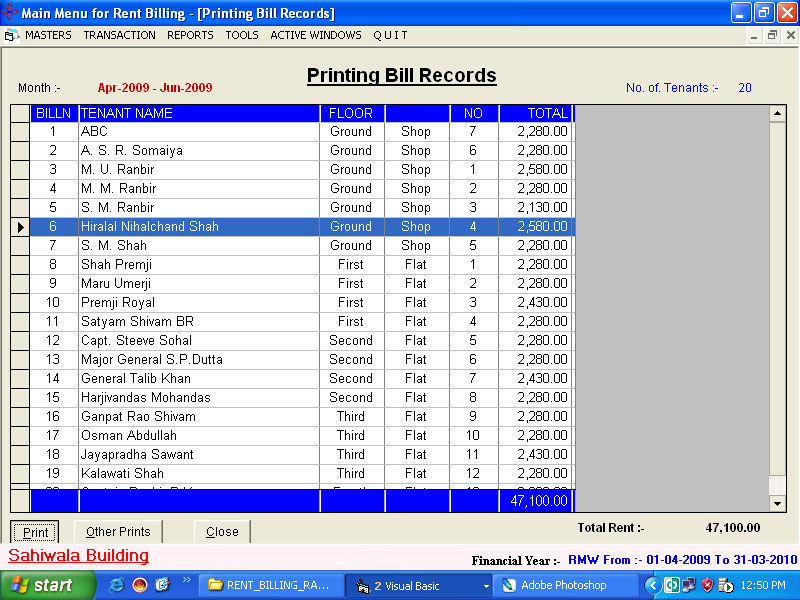 To print the bills for some specific period go to print Bills and there by specify Date of the bill and from which to which i.e. 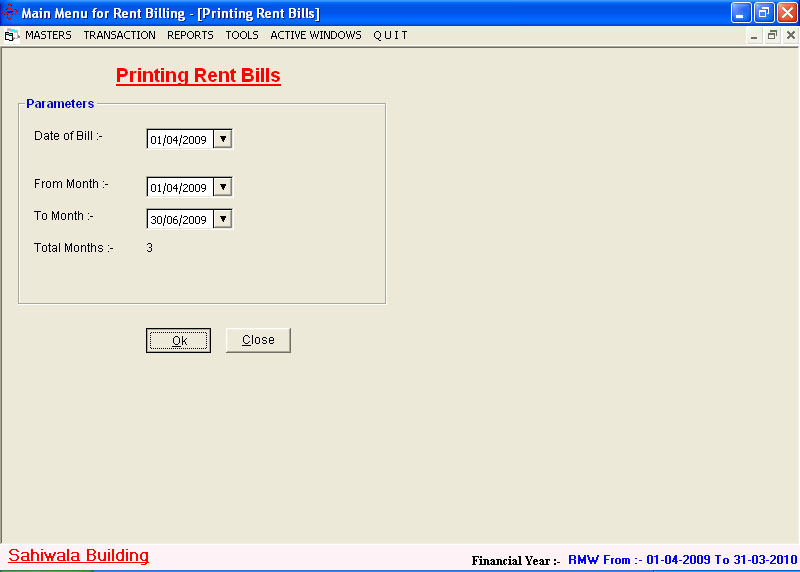 the duration period.the print bills will generate the records and it will get debited to the tenants ledger accounts and the bill will get printed. 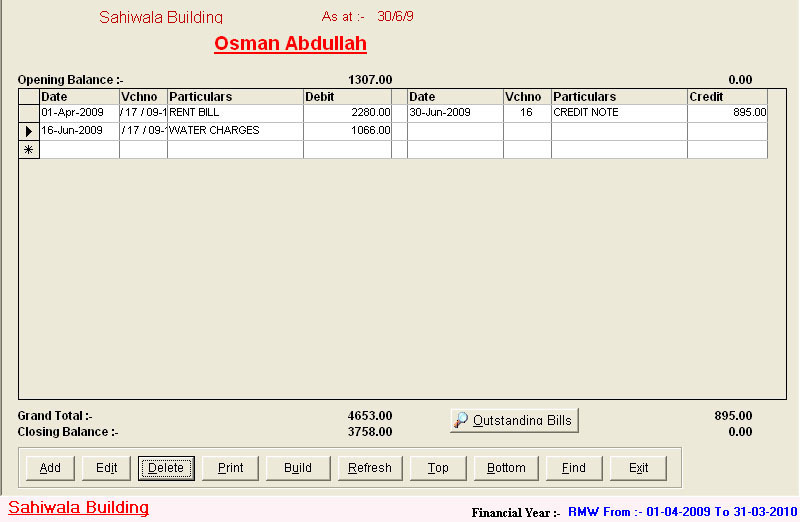 After making the payment of the bill, go to the receipt button on the main menu to generate the receipt of the bill of that particular tenant. 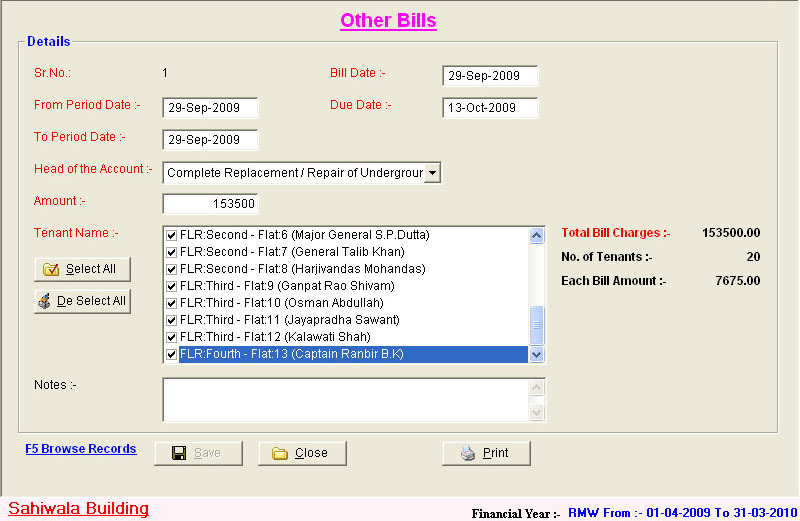 Besides, Tenants Billing Software & Tenants Management Software, there are other bills like water bills and other charges bills for which seperate data entry has to be passed. 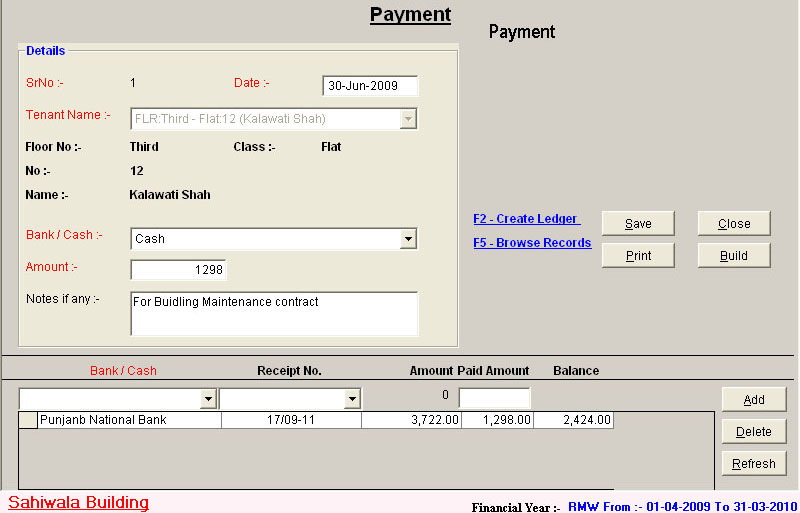 It has the accounts in build where u can data feed the receipts from your tenants in the receipt voucher and automatically your cash or bank account will get debited. 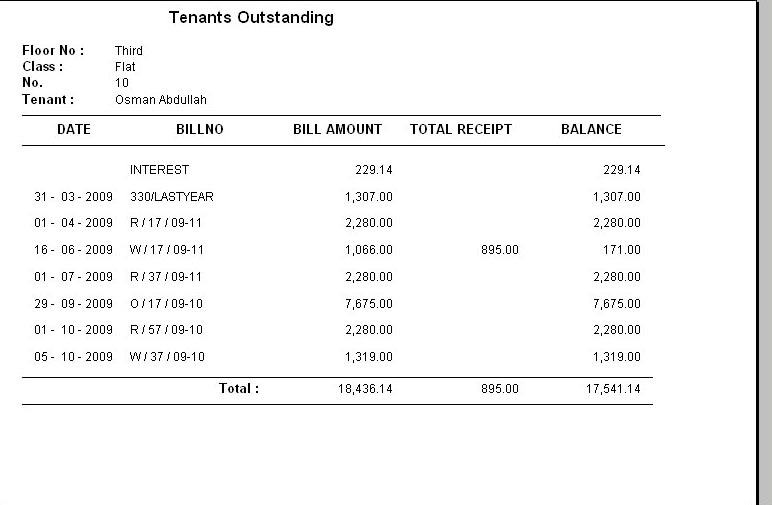 The outstanding balance of the tenants are shown in their ledgers against there bills and receipts entries. Main Menu Screen of Rent Tenant Software. 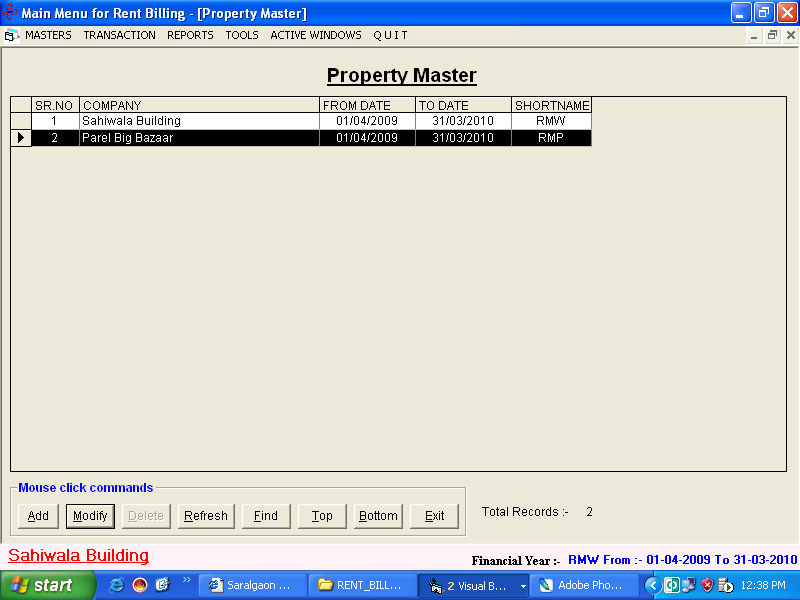 Property Master Records Screen. .
Main Menu with Print Bills Highlighted. 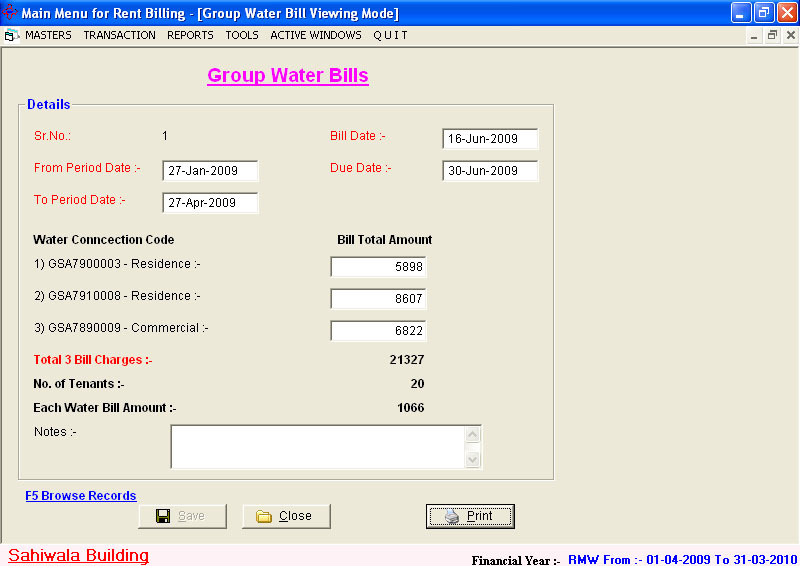 Water Bills Data Entry Screen. 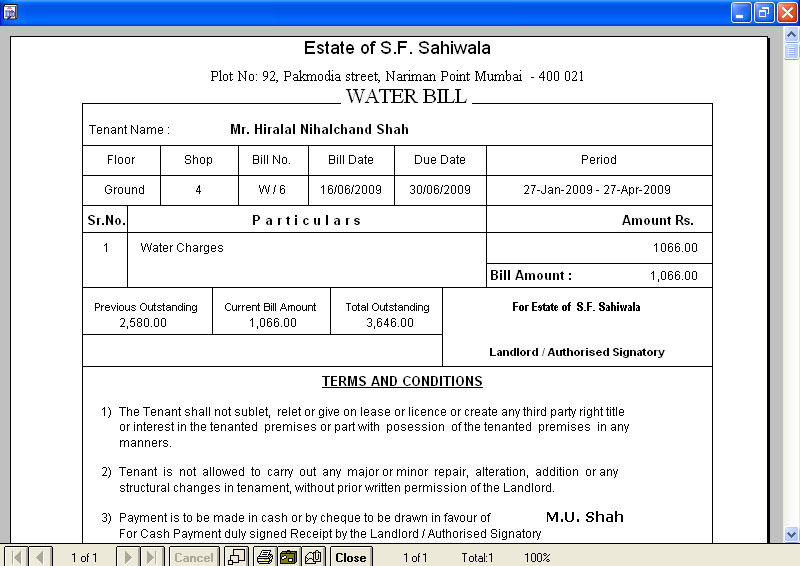 Other Bills Print Out Screen. 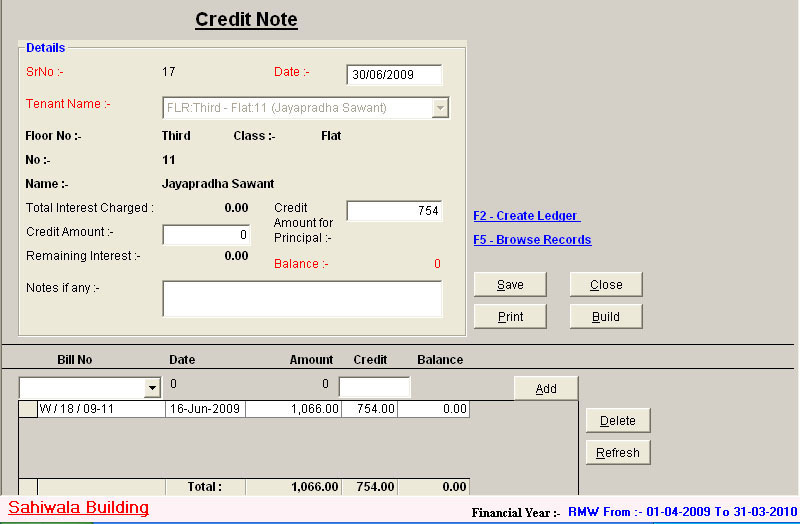 Credit Note Data Entry Screen. 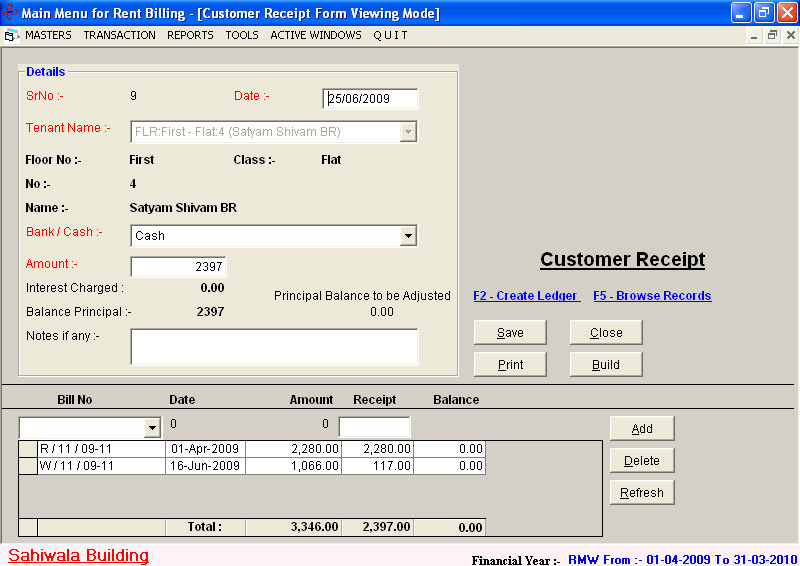 Payment Data Entry Screen .